Bitcoin Press Release: A weather balloon will be released from a launch facility near Sheffield, England. Slung underneath the balloon, will be a net containing 400 “golden tickets” each worth 400 Litecoin Cash (LCC). April 9th, 2018. London, England: The balloon will rise to an altitude of over 32km (100000 feet). At the apogee of the ascent, a release mechanism will allow the tickets to disperse. They will reach speeds in excess of 300km/h before slowing down as air resistance increases. 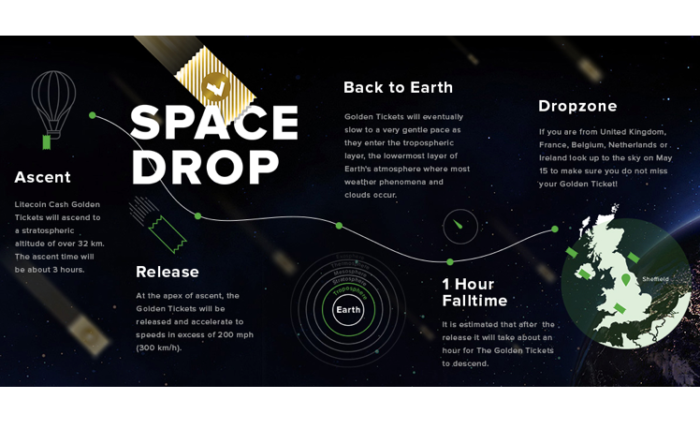 It’s anticipated that the golden tickets could take around an hour to reach the ground, and scatter over a radius of several hundred kilometers, so those in Great Britain, Ireland, France, Belgium or Netherlands should watch the skies for a golden ticket! A 360-degree camera on a bespoke mount engineered by Sent Into Space, will capture the release from a truss facing the payload, and a video will be made available as soon after the event as possible. The Litecoin Cash team envisage the spacedrop as an end of season grand finale to round off a successful first two months in which the fork was launched, core wallets released, a community has been fostered and grown, SPV desktop wallet and server software has been ported, and a white paper released. and innovation to create inspiring experiences. A rapidly growing company, based in Sheffield, UK, they have been applying their expertise in edge of space flight operations since 2011. Now encompassing a research arm with ties to multiple universities and the UK Space Agency, a nationally acclaimed educational program, a suite of corporate marketing and publicity services and a range of do-it-yourself kits the seem the obvious choice to make the dream of the first ever cryptocurrency space drop, a reality. “We’re extremely proud to be working with Sent Into Space for this monumental and exciting event. With their exceptional track record, in-house expertise and forward thinking creative and marketing team, we see them as the perfect partners to literally launch our currency to the upper reaches of the atmosphere“. Litecoin Cash is the source of this content. Virtual currency is not legal tender, is not backed by the government, and accounts and value balances are not subject to consumer protections. Cryptocurrencies and tokens are extremely volatile. There is no guarantee of a stable value, or of any value at all. Token sales are only suitable for individuals with a high risk tolerance. Only participate in a token event with what you can afford to lose. This press release is for informational purposes only. The information does not constitute investment advice or an offer to invest. The post Litecoin Cash Announce Their Plans for Worlds First Cryptocurrency SpaceDrop appeared first on Bitcoin PR Buzz.